Stable and accurate measurement under aggressive slurry maximize the productivity. Minimal downtime and maintenance work. In the digester application, pulp is produced by placing wood chips into a digester where it is cooked under high pressures and temperatures in a caustic solution termed white liquor (a mixture of sodium hydroxide (NaOH) and sodium sulfide (Na2S)). The mixture of wood chip and liquor is steam heated, and the wood chips are dissolved. The spent mixture of white liquor and lignin is known as "black liquor". After the cooking, the pulp is discharged from the bottom of the digester using a blow-unit through the blow valve and into the blow tank. 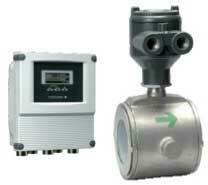 In the flow measurement in the digester applications, following two applications are the most challenging. 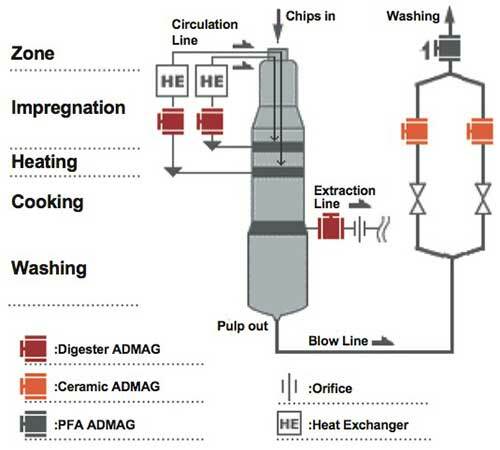 Pulp slurry measurement in Blow line. And conventional magmeters have following problems. Heavy pulp slurry generate the slurry noise and produce an unstable output with resulting the loss of accuracy and control. Measuring heavy slurry the pulp stock due to problems related to the electrode seals and liner abrasion which results in a short life expectancy. The adhesive black liquor require frequent maintenance for the electrode cleaning. ADMAG AXF series delivers stability and durability in each applications that contributes maximize the plant productivity and reduce the maintenance cost. as circulation/extraction line or blow line, helping the user to optimize the process control and the performance of the plant operation. Reliable flow tube design with the PFA liner retained with metal plate and the spring loaded electrodes realize the mechanical robustness, and extends the life time of the flow meter. In addition, the use of a metal hat protect the leading edge of the flow tube by covering the front leading edge of the lining. The ceramic lined AXF enabled accurate and stable flow measurement of the line measuring very aggressive slurry. The purity of alumina reaches 99.9% and provides better corrosion resistance and mechanical strength. This design allows no room for leakage, and provides extremely slurry resistant, enabling stable and accurate measurement. In addition, the optional mirror finished surface reduce the adhesion level by having smooth surface. The electrode coating diagnostics functions delivers the four levels of coating. This function can be optimization by each customer for his individual process, and the values for the four levels can be individually set in the field. This allows the user to predict when preventive maintenance is needed, and remove the meter for cleaning before an interruption in the measurement occurs.